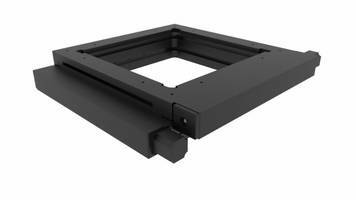 Dual-Axis Large Aperture XY Stages from IntelliDrives are available with stroke of 100, 200 and 300 mm with apertures of 188, 288 and 388 mm. Units are used in scanning microscopy, wafer and printed circuit board inspection and automated assembly. The stages can be motorized with stepper motors and brush-less servo motors. Units provide fine positioning and control using stable closed-loop control system and joystick option. The demand for a high accuracy, robust, open-frame stages is met with IntelLIDrives dual-axis, large aperture stages that address the unique needs of scanning microscopy, wafer and printed circuit board inspection, automated assembly and wide range of specimens and samples scanning in many types of imaging techniques and applications.